Interesting and different spa products . . . are just a click away!!! Check out some interesting spa and hot tub products. They just might make your day or help solve a problem. askalanaquestion.com . . . information and ordering are just a click away! Scroll down to browse through information on a variety of Spa and Hot Tub products. You'll find products that will help you solve problems, products that will make spa or hot tub maintenance easier, alternative ways to sanitize a spa or hot tub and lots more interesting and different products. The Website Store Directory contains an alphabetized listing of all products for sale. We don't just sell products. We help you make a better-informed choice, by providing all the information, you might require. Need ordering help? Scroll down any product ordering page, for the Order Desk Telephone Help Number. All items ordered will end up in the same shopping cart, no matter on which page of this website, the items are located. These items can be ordered on-line, from askalanaquestion.com, with convenience and security. All Major Credit Cards and PayPal* are accepted. Order some today. The right Spa Sanitizers . . . can solve many problems!!! Drape-Over Saltwater System Hot Tub and Spa Chlorine Generator. A simple press of a button, changes power level. Clear cell compartment allows for easy inspection of the salt-cell plates. Self Cleaning design, avoids scale buildup. No electrical or plumbing installation is required. Affordable and clearly a better way to do chlorine. Comes complete. SmarterSpa is an Automated, Drape-Over Salt Chlorine Generator, for Spas and Swim Spas. It's SMART enough to know when to produce more chlorine and when to shut itself off. NEVER OVER-CHLORINATE AGAIN. Put and end to too much or too little. Plug-n-Play design keeps it simple. The Automatic On/Off operation is based on the actual chlorine content. This is the better way to do chlorine. Salt chlorine generators have been used by pool and spa owners, seeking to improve water quality and reduce the day-to-day sanitizing requirements, for more than 35 years. 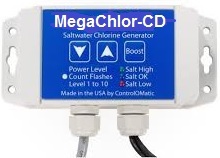 The MegaChlor-CD uses Chlorine Detection Technology to turn itself on and off, only when there is an actual need to add chlorine. Higher output suits larger spas and swim-spas. Never over chlorinate again. Requires NO installation. Plug-n-Play ready. 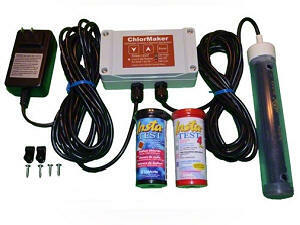 Salt chlorine generators have become increasing popular, for over 35 years. The NEW MegaChlor Drape-Over can easily meet the sanitizing requirements of Swim Spas up to 5,000 gallons and Spas, up to 1,000 gallons. Fully featured with 10 levels of chlorine output, Operates independently of the pump or spa controls. Effective and affordable and just what you need for larger spas or swim spas. There's a model, that just right for your needs. Spa Salt Chlorinator, Replacement Cell, only. Does not include power supply or test strips. For Small-Average Spas up to 400 gallons. This Salt Cell can be used as an ace Replacement Salt Cell. Used in a leading line of popular spas, with built-in Salt Chlorine generators. Does not include the controller or anything else. Includes only the salt cell, as shown above. The right Spa Water Testing products . . . can solve many problems!!! 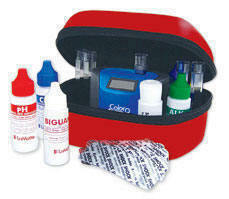 ColorQ Digital Water Analyzers eliminate all color matching and guesswork. Ten (10) models perform 4-11 different test factors: Free and Total Chlorine, Bromine, pH, Total Alkalinity, Calcium Hardness, Cyanuric acid, Copper, Iron, Biguanide and Biguanide Shock. The Award-Winning Pool and Spa Testers, offer a model for every pool or spa need. Trilingual instructions. With a salt chlorine generator, this Professional-Grade Test Kit, provides all the testing, you need. The Tracer PockeTester digitally measures salt, TDS levels and Temperature. The Insta-Test PRO 600 Test Strips tests for Free Chlorine, Total Chlorine, Bromine, pH, Total Alkalinity, Total Hardness and Cyanuric Acid. The Insta-Test PRO Phosphate Test Strips measure phosphates. This is the ULTIMATE way to test pool or spa water. 4 models: Indoor, Mobile, Commercial and Drinking Water. Run a complete water analysis, for up to 10 test different factors, in just 1 minute and get computerized results. This is as good as it gets. So easy! So fast! So precise! Voted product of the year. Bundled savings available. You can order replacement test chemicals and supplies, for every LaMotte tester, including all ColorQ models, all WaterLink models, all individual test kits, all PockeTesters and all professional testers. We tried to list every item. If we missed something, please send us an email and we will accommodate your needs. It's all factory fresh, so don't settle for anything less. This 6-in-1 tester is a hand-held, digital meter, designed to measure 6 important pool and spa chemistry test factors. It tests for Salt, TDS (Total Dissolved Solids), Free Chlorine, pH, ORP (Oxidation-Reduction Potential) and Temperature, making this an especially ideal tester, for use with salt chlorine generators. No chemicals are required to do the actual testing. Ideal for Professional or Homeowner use. The right Spa Maintenance products . . . can solve many problems!!! Portable vacuuming made easier and better. Use a handy, battery-powered vacuum to remove sand and debris from the spa floor. Spa models are light, easy to use and includes a spa pole, for extended reaching. Swim-Spa model attach to a standard pool pole. Built-in filter bag is reusable. No hoses, no tangles and no cords. A complete line of products to prevent or remove iron, copper and manganese stains, from all types of spas. The Stain Remover product dissolves the metal stains, the 2-part Pool Refresh product helps you filter or vacuum the metals, out of the water. The phosphate-free chelating agent helps avoid recurrences. Phosphates are also removed, in addition to the troublesome heavy metals. Ultra Poly One Coat from Poly Solutions is the easy-to-apply, hybrid-epoxy, coating that creates a beautiful new look. Ultra Poly One Coat can be used on plaster, gunite, marcite, green concrete, acrylic, fiberglass and quartz aggregate surfaces. Simple preparation, long lasting and an extended warranty! Includes a non-slip additive. Choose from 5 stock colors or choose your own custom color. The DIY way to a better look. When Torque Lock™ Staples are combined with epoxy, you can rest assure that the structure has been stabilized and fixed, permanently. This revolutionary "concrete stitching" technique is great for repairing structural cracks on any solid cement based surface, as it stabilizes the crack with 5,000 pounds of force. Makes a rock-solid durable, repair. A compact design made for Spas and SwimSpas, Eight (8) powerful magnets achieve better results, by removing scale and protecting equipment. One Collar set with 8 magnets. Simple to install. Fits pipes up to 2-inches. Simply clamped around a return line. Requires no power connections. The normal pH operating range, for pools and spas, is between 7.2 and 7.8. Above that range scale can begin to form on underwater surfaces, especially with high calcium hardness. The right Spa Accessory products . . . can improve your enjoyment!!! The Cover Valet is the world's leading premium spa cover removal system. It is designed to fit in almost any back yard environment; inside a gazebo, against a wall, or even mounted into an existing deck. Dual gas springs assist in lifting and lowering the cover. A locking safety feature holds the cover open until time to close. Cover removal will be 1,2,3 easy. Spa Thermal Covers serve a useful purpose: they help retain the heat and minimize evaporation. To make removal easier, many spas use a cover lifter. While this makes uncovering the spa easier, it can leave the spa with an unappealing view of the underside. Now you can easily attach an attractive mood setting scene. Choose from 2 sizes and several scenes. The Spa Side Handrail™ is the most user friendly spa side assist product on the market. This device provides 180 degrees of movement to allow for easy spa entry and exit. An added locking feature enables the handrail to be fixed in any position for increased safety and peace of mind. A little safety adds peace of mind. Getting in and out of a spa should not have to be difficult or unsafe. This revolutionary, patented product uses NanoTitanium, to provide innovative filtration and purification solutions for Pools and Spas. Using the patented porous Nano-Titanium Technology, your water will be so clean and clear, you will see and feel the difference. Available in pool or spa sizes. This is 21st Century Technology. Lasts 4-6 months.